Kalpa is situated at an altitude of 2759 m from the sea level, on the old Hindustan Tibet Road at a distance of 260 km from Shimla. 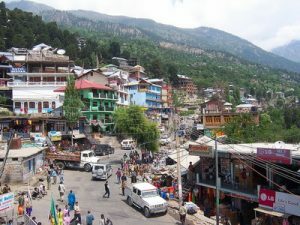 Earlier it was the District Headquarter of Kinnaur. It is 14 kms. and half an hour’s drive from District Headquarter Reckong Peo. It has all the characteristics of a heritage village. Kalpa came into prominence in the wake of British Governor General Lord Dalhousie’s visit in th 19th century. The Narayan-Nagani temple is an exemplary of local craftmanship. 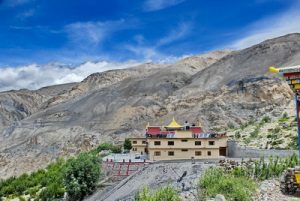 There are couple of Buddhist monasteries at Kalpa including the Hu-Bu-Ian-Car Gompa, said to be founded it by Rinchensang-Po (950-1055AD).Kalpa is dramatically located close to the foot of 6050 meter high Kinner Kailash. This is the legendary winter home of Shiva. This is a spectacular sight early in the morning as the rising sun touches the snowy peaks with crimson and gold light. 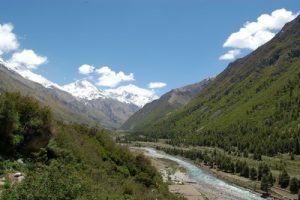 Sangla, a populous village, situated on the right bank of the Baspa river, is famous for its high fertile soil, at an elevation of 2621 m above the sea level and falls at a distance of 17 km from Karcham. It is built on a slope with the house rising one above the other; the scene being closed by the gigantic Raldang peaks towering behind. The forest scenery all-arround and the eternal snow peaks are picturesque. Journey from Karcham onwards is enjoyable and adventurous throughout the valley. The natural scenery all arround and the eternal snow view are picturesque and charming. It is located in the famous Baspa valley. The whole of the Baspa valley is one of the prettiest valleys mainly due to its flat terrain and green vegetation on the slopes which are not very steep. Chango (3058m) : At a distance of 122 km from Kalpa, is a collection of 4 hamlets in Pargna Shuwa, sub-tehsil Hangrang on the left bank of the river Spiti. It is encircled on every side by high hills which is witness to the presence of a former lake. Buddhism is generally practiced here but there are some local Hindu deities too namely Gyalbo, Dablaand Yulsa. 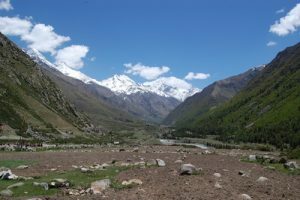 Chhitkul(3450m):This is the last and highest village in the Baspa valley. It is situated on the right bank of the Baspa river. There is a road along the left bank from Karchham. There are three temples of local goddess Mathi, the main one said to have been constructed about 500 years ago by a resident of Garhwal. The square ark of the goddess, is made of walnut wood and is covered with clothes and surmounted by a tuft of yak tail. Two poles called bayanga are inserted into it by means of which it is carried. The goddess has a mouthpiece.